It's been awhile since I've posted any ground-breaking new discoveries, so I thought I would pass on a bit of info about the Group Calendar and displaying default groups. Disclaimer: this is still in beta, and not running on a production site yet. I've stumbled across a few blog posts about the group calendar, and the need to display a default set of resources on the calendar. 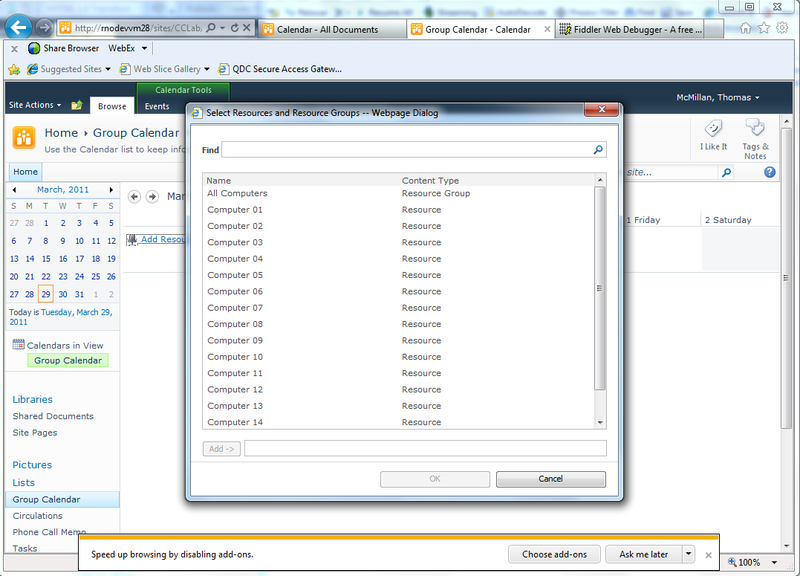 The OOB functionality requires the user to select a resource/resource group before items show up on the calendar. Being the stubborn developer that I am, I decided that I would come up with a fix for this based on a specific requirement from one of our Business Units. This solution works for Resource Groups, but I'm sure it can be modified to easily display resources or people, depending on your requirements. This shows that the type is 1, and add = true. Once I had that information, I just needed to track down the XML data being passed from the picker dialog. That's where Fiddler comes in. If you aren't familiar with Fiddler, you should be. I won't go into too much detail, but will give you the gist below. First, I opened an instance of fiddler and launched IE, browsing to my home page (which contains my group calendar). I then clicked the "Add Resources" link, and added a Resource Group called "All Computers" and clicked "OK". You'll see below that the events now display for each resource in the calendar. I then went into fiddler, and took a look at the final request from Picker.aspx, and began scanning the TextView for any information that might be helpful. And there it is, in an ecma encoded string. The full XML return value from the dialog window. I copied the ret variable and began scripting a new function for the home page. As always, if you have any questions, feel free to ping me. Hopefully, this will save you some time and make you look like a rockstar! This worked great. Thanks for the information. I would like to create a second calendar view for a different group of resources. I'm not quite sure how to identify the right calendar by ID and what code I would need to add to make this happen. Can you add information on how this could be accomplished? That's a great question! What I typically do is view source on the web part page and do a search for the title of my web part, e.g. Group Calendar Computer Lab. What you'll need to do after that is look for the <td id="MSOZoneCell_WebPartWPQ[number]" that surrounds the web part. the WPQ[number] is the ID you are looking for when populating the selector using my script. As I mentioned in my post, WPQ2 was the context ID that I needed, but your web part may have another context ID. The context ID is always in the WPQ[number] format however. Thanks for you awesome workaround. Where multiple calendar are placed on the page, would this be the correct format to use? That’s brilliant! Thanks for sharing it. Can you think of a way of dynamically generating the list of items and pumping it back into your functions? I’m just thinking of the long term maintenance. Hi Thomas, i’v got something that works but it’s very messy. Iv taken your code and added a variable items that is included when setting them xml variable. Then added both web parts to the page with the calendad and it worked. Sorry I’m more of a network administrator than developer, so not really that easy to follow and not very clean but it works. Ill give SPServices a go. I wanted to use this soution but i can't do what is suposed to be done. Like, where do i find the Style Library and how can i put there a doccument and make the rest..! Keep in mind that i started today "playing" with Sharepoint! First off, thanks for your interest. I would suggest a few basic links to help get you started in SharePoint. One of my favorite sites is http://channel9.msdn.com/. There is a tremendous amount of information on this site, and some really good videos. The Style Library is located at your top-level SharePoint site, e.g. http://[siteurl]/Style Library/ or if you are in a site collection below the top-level site, http://[siteurl]/sites/[site name]/Style Library. You can also get to the Style Library using the Site Actions menu "Site Actions > View All Site Content > Style Library. I would definitely suggest starting with a few training videos to see how SharePoint works. Focus on the content editor web part, as this is how you will include your script on the page where your calendar is being displayed. Thomas, i forgot to say my name! It´s André! I would start to see some videos on content editor web part so i can understand a little better that part! I have found a way to do what you have told and created a Content Editor Web Part and made a link to the txt file that you have told. Then in the Style Library linked the j.query to the file. But it´s not working, the only diference is the ribon in the top it's missing. By the way, do you have any clue on how to get it work to populate users ? Finally I could make it work for user ! Thanks again for having found this tip, it helps a lot ! Thank you so much for posting this, and to the commenters like Sylvain who provided additional info. You really saved my bacon. I blogged your solution here: http://amatterofdegree.typepad.com/a_matter_of_degree/2011/08/bacon-savers-1.html. I'm following the procedures but I can't go any further beyond "Here is my final script to populate the calendar:"
So what's next? Sorry this question sounds stupid but I have no experience on dev. Outstanding, really did the trick for moving my project forward. Only question I have is, when I goto create an event all my resouces are added, is there a way to remove them other then select all\remove? Or maybe I'm missing some thing not sure, let me know if you have some time. i am Jim from Italy. This script is great. Is there a possibility to delete the link "add ressources" in the view. So that a normal user can`t ad ressources. this worked great for me both for resources and people. 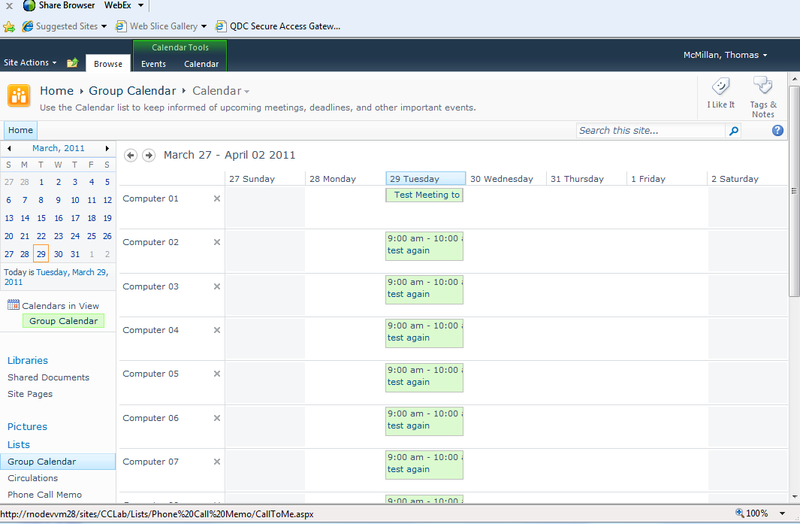 There is only 1 strange thing: in the group calendar page now i'm missing the "Calendar Tools" tab from the ribbon... I can only see the "Browse" tab. How do you get this to show people? I am encountering similar problem with Mr. Civilization... when I create an event, the system take all resources to next reservation form, is there anyway to book one particular resource instead of all? I have a small project need help. Please contact me if you feel interest, my email: itseraph@gmail.com, thanks. how do you add the script to sharepoint where do yo put it and how does it execute. You can add a script using the <script> tag in a content editor, or you can add it to the <head> tag using the <script> tag via SharePoint designer. 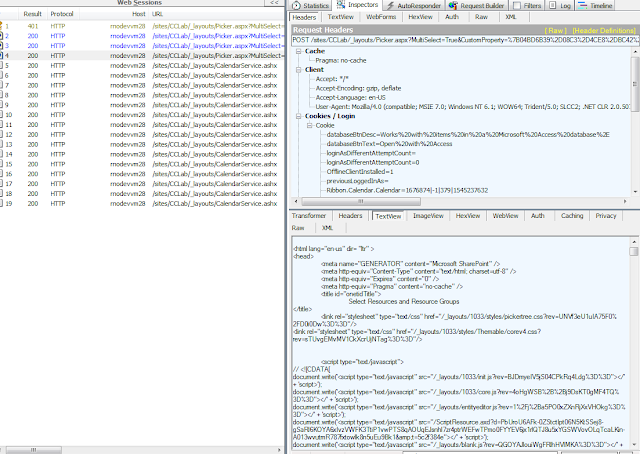 Jquery.min.js is that file already in Sharepoint or do I need to download it from somewhere and upload it to the SharePoint Server? do I create an HTML page and paste this script in the head of the html page and then copy the whole lot into the content editor? You need to follow the steps to determine what you need to pass via fiddler. At that point, you would modify the "var xml = " with the new values you get from fiddler. I got the values from fiddler, added the jquery.min.js to my top level site and did the var sel2 line. What am I missing? It's still not working. Could someone post the entire code that works for people, not resources? First of all thanks for this lovely tip. I' ve applied this to our SharePoint 2010 resources calendar but it works only on my user account, so it didn't work for other sharepoint users. Could you help me please, how can I populate the calendars for all users. I' ve applied this to our SharePoint 2010 resource calendar but it works only on my user account, so it didn't work for other sharepoint users. Could you help me please, how can I populate the calendars for all users. For me the problem was that the other user did not have access to the jquery file. I've got some issues with this "Workaround" can somebody help me please? I got it!! I was trying to call the script from the Content Editor with a < script> tag -- wrong!! Very creative solution! Nice work. I can't seem to make this work. I have a group work site (http://indev/juv/JSiteProject) as a subsite of team site (http://indev/juv). I have added the jquery.min.js file to http://indev/juv/JSiteProject/Style Library/jquery.min.js. I am trying to get this to work for two additional people besides me - glsumpter and soeagleton. I really need the solution that you discovered but I am not an experienced SharePoint developer. I have the need to display three exchange calendars on a calendar that I have already created and have it working. I have the same problem of losing the exchange users every time I refresh. I copied your code from above and placed it in a txt file. 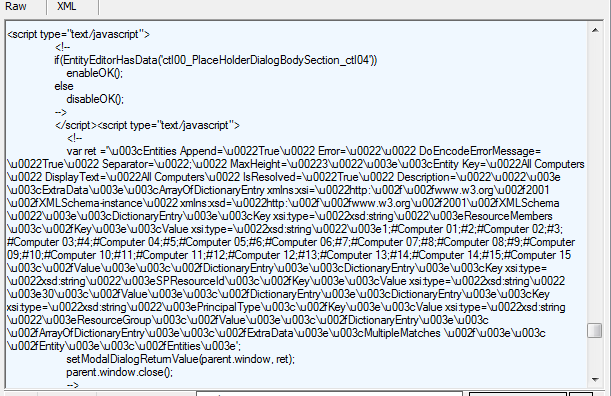 However in SharePoint Designer (2010) I do not know how to add this code or the txt file. Is the code ultimately pasted into the html code in the default form? I also liked your tip about uploading the file to a specific style library but not sure how to do that either. I understand if it is too much to train a novice, but I would certainly appreciate it as my company will probably not spring for a 3rd party web part. Hi Thomas, thanks for the script......however, i am quite new to the SharePoint designing, I have uploaded the script file under the "Style Library" folder....where i should refer this file, to have users appear on my calender? The only thing is that when i want to select one resource at a time, the list form display all Resources list so I have to Remove all resource first and keep the resource I need in the list. First of all, thank you for the tip. But is there any way I can display all booked resources in a month rather than a day or week? Hi this was exactly what I needed thank you. I would if you could add to this. I have 2 calendars and I would to filter resources list (or at least set the default option) depending what calendar Is being used. It worked but now ie doesnt't show the resources and my calendar anymore. The solution works... you can use Firebug in Firefox or the Development Tools in I.E. 9.0 pressing F12... this way will return exactly the appropiate names of your libraries and resources. 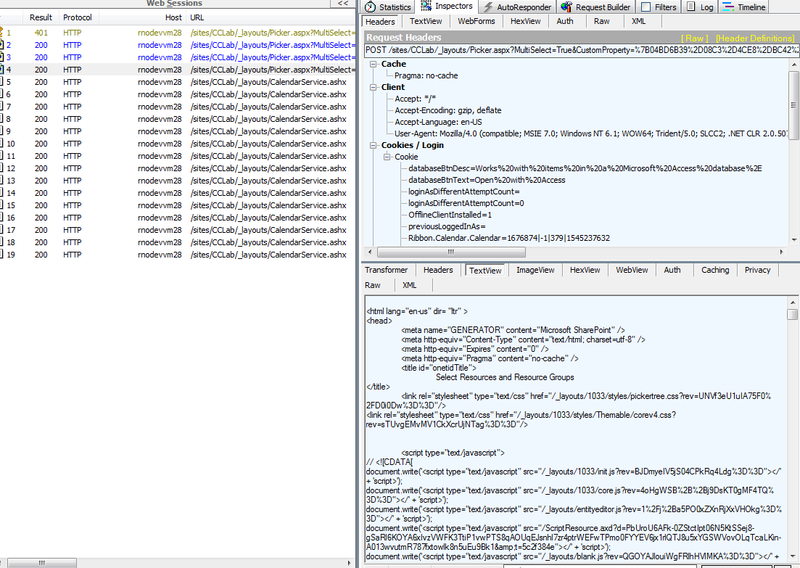 A couple issues that I found, in Sharepoint 2013 does hides the ribbon on execution. also only seem to work for Opera and Firefox. for Internet Explorer 8.0 and 9.0 does not return anything. I really miss the webpart in MOSS where a simple calendar can take care of Double Booking without have to involve resources. for a simple meeting room just a calendar with double booking validation is enough. but that does not seem to exist on Sharepoint 2013. Will keep looking for a way to activate teh ribbon and show the correct results in IE. but very nice attempt to make things work. but in my scenario I have to display resource name dynamically on Group calendar. 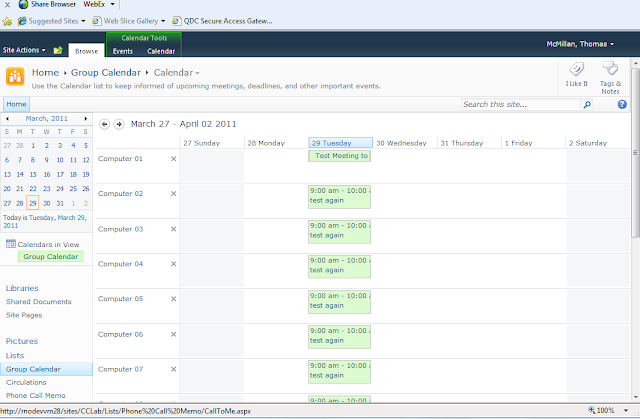 Means is there any resource added, deleted or updated same changes reflected on group calendar. So please suggest me how to do this. Thanks for the post. It works great. Do you have any idea about using this trick with overlay? If I add an overlay view on my calendar it doesn't display its content because adding a resource only applies to the "base" view, and not the overlay view. Hello, my name is Juan Pablo am from Argentina. Achieve perform successfully the resources "rooms" are displayed correctly when loading the page. But I have a problem, I need you can see all the users of the organization in the same way and not just me. We appreciate your help to accomplish this task. Is this code work for SharePoint 2013 calendar. Hi, Thanks for the great solution. I was implementing this and I am facing some issue while I am refreshing the page. For the first time when I refresh the page I am not getting WPQ2, so that sel is coming null. I tried a lot but not able to do this. Can you please help me on this. I am using in SharePoint 2013.